Hi, just looking at how the 4G interference potential can affect those people who use caravans. Currently there are several different aerials fitted to caravans, Directional as per the Status 550 and numerous Omni-directional aerials. Going forward would you recommend Directional rather than Omni-directional? What about the coax cable running through the caravan, would this need to be replaced if poor quality cable has been installed by the manufacturer? Steve e Boy: A directional aerial focuses signal in one direction. The "gain" is simply that with respect to an omni-directional antenna (or a, theoretical, isotropic antenna [dBi], but let's not go there). Gain is at the expense of "loss" in other directions. So it is not the case that an omni-directional aerial is better, per se. However, all TV signals come from one transmitting station and therefore one direction. Hence it is good practice to use a directional aerial as your aerial will be less sensitive. As a caravan goes to different locations, signal levels can vary. The aerial shown in that link is a Blake DML26WB (other suppliers are available) and it is especially suited to touring for a number of reasons. Firstly, it is a log periodic which has roughly the same level of gain across all frequencies (yagis aren't as good on lower frequencies/channels). The elements are flat which should make them more rugged; most other logs have round elements. It has a bracket that allows it to be set on an incline which might help in some situations. Use double-screened cable with a pure copper core (not clad copper) and copper foil with copper braiding such as Webro WF100. Also have a variable amplifier to hand. This won't always be needed, but it may be useful in some locations. It would also be useful to have a filter to protect against interference from 4G base stations which will come on the air in the next quarter. This might as well be fitted permanently and before any amplifier. Your original question pertained to potential 800MHz 4G interference, but this depends on a variety of factors including where the 4G signal is coming from, how sensitive your aerial is in that direction and how strong the TV signal is to how strong the 4G signal is. The way to protect yourself is to install a filter and use good screened cable. The frequency range is given in the instructions as FM (88 to 108MHz), DAB (175 to 230MHz) and UHF (470 to 860MHz). So, as perhaps is to be expected, the 800MHz band that is to be used for 4G is part of its spec and will need filtering. 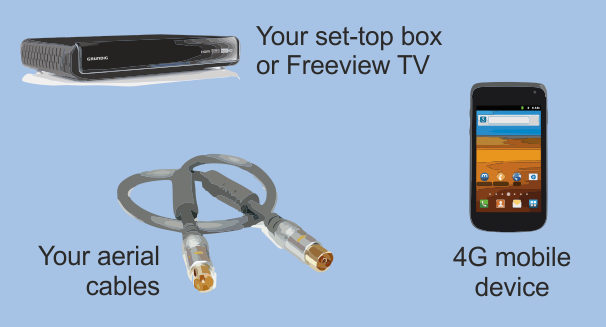 The fact that the aerial is designed to pick up FM, DAB and TV means that these frequencies are passed down the aerial lead (before being split within the amp). This could affect the type of filter you can use. The filter needs fitting before the amplifier as the 4G signal can have an adverse effect on it. However, if you fit a filter that only allows through the frequencies for TV, it will prevent FM and DAB signals being passed. The filter seen in the photograph is a SAC AE5100 which says on its body that its pass-band (that is the frequencies it lets through) is 470 to 790 MHz. Obviously that will inhibit FM and DAB. I'm not a professional, so don't know whether such filters are available that will pass FM, DAB, UHF TV (21 to 60) whilst blocking 800MHz 4G (UHF channels 61 to 69). 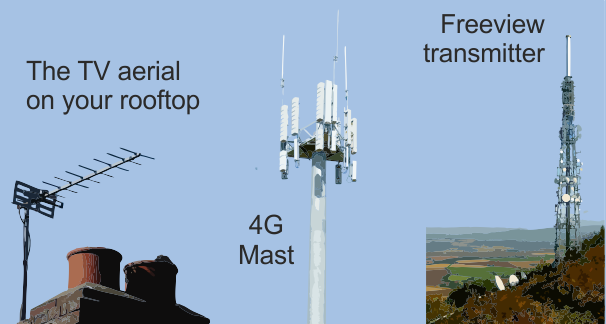 If there is, then it will allow the aerial to be used for FM and DAB whilst being protected against potential interference from future 4G. It may be worth contacting the manufacturer to see what it intends to do. Maybe it will produce a filter. The more 4G phones come into service the more the possibility of interference from them in close proximity to your receiver. The thing is that you won't know what is the cause if it is outside and it will be intermittent. Ideally, aerial amplifiers should have 800MHz filters built-in, but this will be down to the manufacturers. Surely this means lots of homes will be without TV? I live in a conservation area and we are not allowed to install satellite dishes. Cable TV isn't available in my street either. I would have thought there are a lot of people in this situation - so if any of them are affected what will the solution be? James: How many conservation areas is there a dense spread of population which would require a number of mobile base stations to cover them? How many conservation areas allow installation of odious mobile phone masts? James: There are ways of getting around conservation area problems where satellite dishes are concerned if a residents garden has any positions where its possible to obtain an unobstructed view of the S/SE Skyline whilst preferably (but not essentially!) not being visible to a passing roadway. Should a spot be found in their garden that meets the positioning requirements then there is absolutely nothing to stop them using a portable satellite reception dish kit of the type used by most caravanners, as the dish is mounted on a small tripod and with its total height being only about 4 feet or so above ground level, the dish being simplicity to align compared to a normal wall mounted type as its LNB is fitted with coloured alignment LED's which eliminates the necessity to use a meter, a friend of mine in the next village which is also a conservation area having used one of these kits for nearly two years now without so much as a whisper from anyone in authority or otherwise, as its not actually classed as an installation by it being a completely free standing structure of a portable nature. Hi, do you know when the 4G service is due to start from the Bexley Hill (Midhurst) site? The situation here is about as bad as it can get as the same mast will be used for Freeview and 4G. The highest channel used by Freeview there is 58 so there will be 2 'guard' channels between that and the 4G signal but the very nature of GSM signals i.e. pulsed is likely to cause splatter. Smiffy: Just to clarify from the article. 3) 4G isn't GSM, it's LTE. "When 800MHz 4G mobile broadband services start there will be 5 multiplexes in C52-C60 range: C59: COM5 C55: PSB1 C58: PSB3 C56: PSB2 C54: COM4 "
I live in the WN6 postcode and receive my Freeview from Winter Hill. There is bad pixellation and intermittent loss of sound. When I check Signal Strength/Quality I find the Strength is OK (around 80%) but Quality varies from 40% to 90%. I have tried everything I can think of with no success.